Bibimbap is a popular Korean dish. The word literally means "mixed rice." Bibimbap is served as a bowl of warm white rice topped with namul (sautéed and seasoned vegetables) and gochujang (chili pepper paste). A raw or fried egg and sliced meat (usually beef) are common additions. Left: Bibimbap, a Korean dish. The ingredients are stirred together thoroughly just before eating. It can be served either cold or hot. 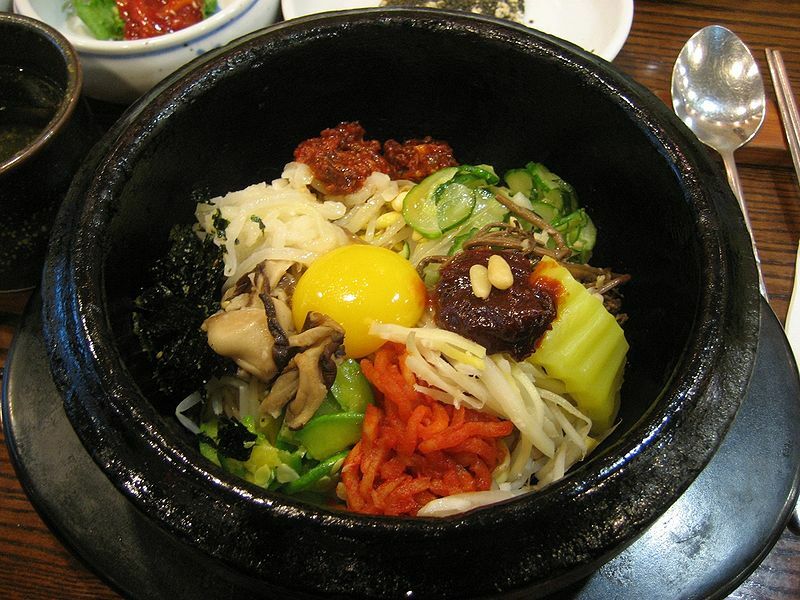 Vegetables commonly used in bibimbap include julienned cucumber, zucchini, mu (daikon), mushrooms, doraji (bellflower root), and gim, as well as spinach, soybean sprouts, and gosari (bracken fern stems). Dubu (tofu), either plain or sautéed, or a leaf of lettuce may be added, or chicken or seafood may be substituted for beef. For visual appeal, the vegetables are often placed so that adjacent colors complement each other. A variation of this dish, dolsot bibimbap ("dolsot" meaning "stone pot"), is served in a very hot stone bowl in which a raw egg is cooked against the sides of the bowl. The bowl is so hot that anything that touches it sizzles for minutes. Before the rice is placed in the bowl, the bottom of the bowl is coated with sesame oil, making the layer of the rice touching the bowl golden brown and crispy. Left: Dolsot bibimbap, a Korean traditional dish comprising various namul and rice. 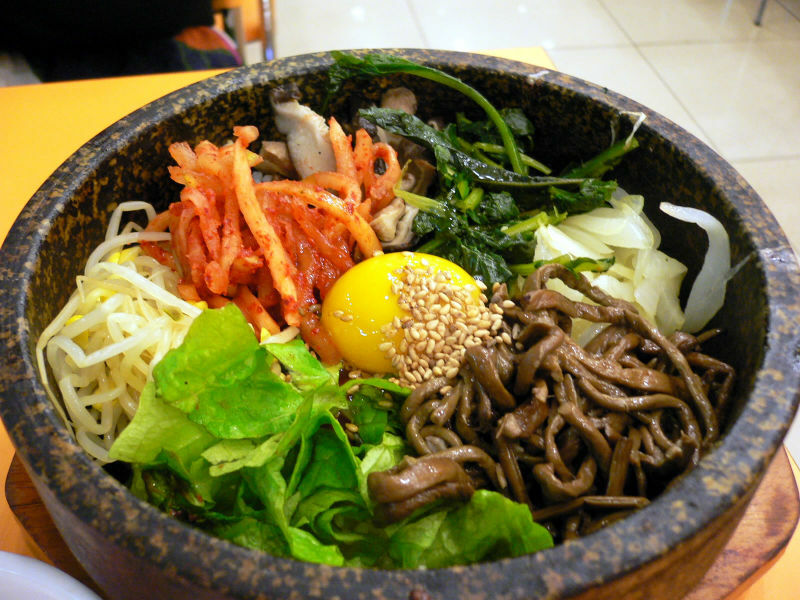 In Korean households, bibimbap is frequently prepared from steamed rice, vegetables, and meat. As one of the most representative items of Korean cuisine, and because of its convenience of preparation, since the late 20th century bibimbap has been served as an airline meal on various airlines connecting to South Korea.